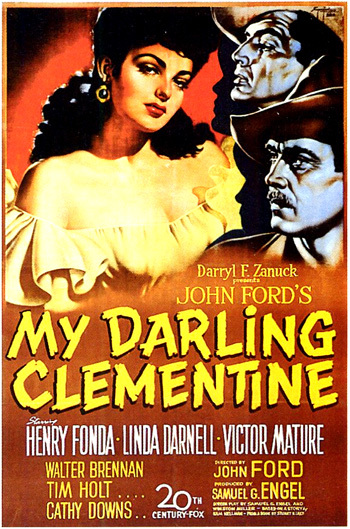 My Darling Clementine (1946) is one of the greatest classic Westerns of all time, directed by one of Hollywood's most honored directors, John Ford. This film foreshadowed other great, more complex westerns that Ford would later direct - The Searchers (1956) and The Man Who Shot Liberty Valance (1962). It was filmed in his favorite locale - Monument Valley in northern Arizona, in only forty-five days. The film's title was not chosen in honor of any of the central characters or the shoot-out, but after the name of Earp's civilizing, female acquaintance in the town of Tombstone. The film's screenplay, by Samuel G. Engel, Sam Hellman and Winston Miller, was taken in part from the 1931 novel Wyatt Earp, Frontier Marshal by Stuart N. Lake. Although the book claims to be an accurate account of Earp (an historical, heroic Western character) and of the legendary O.K. Corral incident from the US past - it imaginatively includes a number of fabrications. Ford's film similarly retells the violent episode of the gunfight-shootout at the O.K. Corral (an actual historical event that occurred on the afternoon of October 26, 1881), the story of the duel between two families - the good one represented by the Earps and the notorious one represented by the Clanton family. The film's theme is the coming of civilization to the West. The western town of Tombstone becomes in Ford's poetic film the point where savage forces (the wild countryside, the rugged Monument Valley backdrops, the brutish Clantons, the Mexican whore Chihuahua) and civilized forces (the urban barber shop, dining room, the new church and school, the 'respectable' Earps, Doc Holliday's cultivated Bostonian learning, Clementine the schoolmarm) meet. Henry Fonda, a superb character actor, portrays the life of the legendary Wyatt Earp, an independent, drifter cowboy and ex-marshal who becomes a responsible lawman. The development of his personal life from a scruffy cowpoke in the first scenes to a dignified, well-groomed Marshal parallels the civilizing of the town of Tombstone - from a rough frontier outpost (with raucous saloons) to a civilized, law and order community settlement (with a church, a school and new schoolmarm, and even a traveling Shakespearean actor). The credits play on wooden placards which each come into view by a twist of the signpost where they are attached, while the familiar ballad 'Oh My Darlin' Clementine' is sung by a cowboy chorus. The setting is Arizona in the year 1882. The four Earp brothers, Wyatt (Henry Fonda), Morgan (Ward Bond), Virgil (Tim Holt), and the youngest James (Don Garner) are driving a small herd of cattle west to California near the small, wild town of Tombstone, Arizona. Each of the brothers is introduced by a low-angle medium shot: first James, and the last Wyatt. On the side of the trail, a buckboard appears with Old Man Clanton (Walter Brennan) and his oldest son Ike (Grant Withers), part of the notorious Clanton outlaw clan. Clanton: If you ain't got 'em committed to no shipper, I'll take 'em off your hands. Clanton: I'll make ya a good offer. Pay in silver, three dollars a head. Clanton: Might raise it to five dollars silver. Wyatt: Made more than that in Mexico. Clanton: They'll be a sorry looking lot by the time they get to California, son. Wyatt: They'll feed out when we get to grass country. Sure is rough looking country. Ain't no cow country. Mighty different where I come from. What do they call this place? Clanton: Just over the rise there, a big town called Tombstone. A fine town. Wyatt: Tombstone! Yeah, I heard of it. Well, me and my brothers might ride in there tonight. Get ourselves a shave maybe. A glass of beer. Clanton: Yeah! You'd enjoy yourself. Wide-awake, wide-open town Tombstone. Get anything you want there. So long Wyatt, Morgan, so long Virgil. His shave is interrupted by gunshots that narrowly miss him and shatter the mirror in the shop. When the barber flees, Wyatt, a law-and-order man, expresses his exasperation with the situation, "What kind of a town is this? Barber?" while walking outside with his face still lathered up and carrying his barber's sheet. Dance-hall girls run screaming from the Oriental Saloon across the street [later in the film after some long establishing shots, the saloon is nowhere to be seen across the street] where a reckless, drunken Indian Charlie (Charles Stevens), a symbol of the wildness of Tombstone, shoots his gun into the air. What kind of a town is this anyway? Excuse me ma'am. A man can't get a shave without gettin' his head blowed off. When the marshal turns and leaves, Wyatt is exasperated that no one will confront the drunk and take charge. Disgusted and still lathered up, he hands his barber sheet to the Mayor, picks up a heavy rock, enters the saloon through the second story window, successfully pursues and subdues the Indian, and then drags the unconscious man by his heels out into the street, where the townspeople have been witnessing the quick dispatch of the man. He repeats his question one more time to everyone: "What kind of a town is this anyway? Selling liquor to Indians." He runs the Indian out of town: "Indian - get out of town and stay out!" Mayor: Wyatt? You're not by any chance the marshal from Dodge City? Mayor? Is that Marshal job still open?...I'll take it...providin' my brothers are my deputies. Wyatt: Who runs the gamblin' around here? Wyatt: Who runs the cattle? Mayor: The Clantons. Old Man Clanton and his four sons. Wyatt: I didn't get very far with 'em. They was rustled this evenin'. Clanton: So, well, that's too bad. You should be headin' for California, heh? Wyatt: No, I figured on stickin' around for a while. Got myself a job. Clanton: Marshaling? In Tombstone? Ha, ha, ha. Well good luck to you Mr. uh...? 1864, 1882. 18 years. You didn't get much of a chance did you James? I wrote to Pa and Cory Sue. They're gonna be all busted up over it. Cory Sue's young, but Pa. I guess he'll never get over it. I'll be comin' out to see you regular James. So will Morg and Virg. I'm gonna be around here for a while. Can't tell. Maybe when we leave this country young kids like you will be able to grow up and live safe. Sir, I really love poker. Every hand a different problem. Got to do a little figurin' here. What would I do if I was in your boots Mr. Gambler? (Chihuahua signals his opponent about the cards Wyatt holds.) You drew three cards and I stood pat and yet you raised me. Now the question is, what should I do? (Wyatt looks up at Chihuahua behind him.) Yeah, mighty interestin' game, poker. Game of chance. Wyatt: If I catch you doin' that again, I'll run ya back to the Apache reservation where you belong. When he returns to his game, saloon chief "Doc" Holliday (Victor Mature) makes a dramatic entrance by striding into the saloon. The reactions of the poker players to his entrance signal his domineering authority and presence. The hands of the professional gambler pause on his winnings, and then he quickly tries to collect the money before Doc marches over to the poker table. Holliday asserts his authority over "Mr. Gambler" by knocking his hat off and ordering the professional gambler out of town. An oppressive silence falls over the saloon as Holliday walks back to the end of the cleared-out bar and stands alone. The poker game is quickly curtailed while Wyatt complains: "Sure is a hard town for a fella to have a quiet game of poker in." The Marshal scoops his poker chips into his hat (which he puts on), and then walks down the saloon bar toward Doc. Holliday: I know all about you and your reason for being here. Wyatt: Heard a lot about you too, Doc. You left your mark around in Deadwood, Denver and places. In fact, a man could almost follow your trail goin' from graveyard to graveyard. Holliday: There's one here too, biggest graveyard west of the Rockies. Marshals and I usually get along much better when we understand that right away. Wyatt: Get your meanin' Doc. As his "guest," Holliday firmly insists that Earp have a glass of champagne rather than a standard whiskey shot. By accepting the champagne drink, Wyatt somehow acknowledges and accepts Holliday's power, and things become more relaxed in the saloon.